63% of executives said that their organizations were ineffective at managing their sales pipelines, according to a study conducted by the Sales Management Association and Salesforce. There are numerous reasons why so many organizations struggle with effectively managing their sales pipelines, and they vary between industry and company size. Every organization is different. There are different practices that work better for one organization over another. 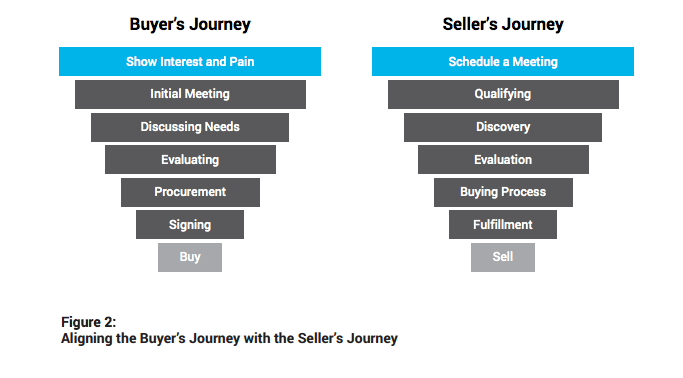 But sales teams that have a clearly defined process that is aligned with the buyer’s journey are the most effective. This enables all sales reps to be on the same page when it comes to various stages of the sales process. Sales pipeline management depends on a clearly defined sales process that keeps the buyer in mind. It’s not enough to have a sales process that makes sense for your sales team, you have to create one that aligns with your prospect’s buying behavior. Each pipeline stage should be thought of as furthering the buyer’s commitment. Effective sales leaders understand the importance of the buyer’s decision-making process and employ the “always be helping” model of sales to move them further through the process. The factor that is hurting your pipeline review meetings most is that you’re not spending enough time in them. The amount of time in each meeting is more important than the frequency of meetings. Sales managers that dedicate at least an hour a week reviewing their reps pipelines are more effective. This gives enough time to dig deeper into the opportunities that should be given more effort and attention. It’s not effective to do a quick sweep of all opportunities in a rep’s pipeline. Instead, focus on a handful of opportunities and spend time on each. You should analyze the rep’s sales process, discuss their competition, and review the key decision makers. Sales managers should focus the bulk of their attention on early-stage opportunities. These are the opportunities that they can have the greatest input on. Deals that are in closing stages are less likely to be affected by manager’s advice. Early-stage opportunities are still being developed and managers have a better chance of providing advice that could move the deal further through the sales process. A common misconception is that skilled sales reps make great sales managers. That is not always the case. It takes an entirely different skillset to be a great sales manager than it does to be a great sales rep. Thus, companies must invest time in effectively training their sales managers to be great sales leaders. Train sales managers on techniques for effectively managing their sales pipeline. This creates a culture of efficiency and organization amongst the sales team, and it enables more productive pipeline review meetings. The majority of sales teams aren’t effectively managing their sales pipelines and their deals are suffering as a result. By establishing standards for the sales process, all reps are on the same page and pipeline review meetings run much smoother.